This is water-based glue. Do you have a mailbox on the road (outside your home), and there's very cold winter weather, the adhesive may freeze. After freezing, the adhesive has become unusable. It's hard / impossible to shake the glue, it is no longer liquid. The glue clots. Usually white cots can be seen on the brush. The glue is watery when the brush gets out. You see the condensation on the brush. 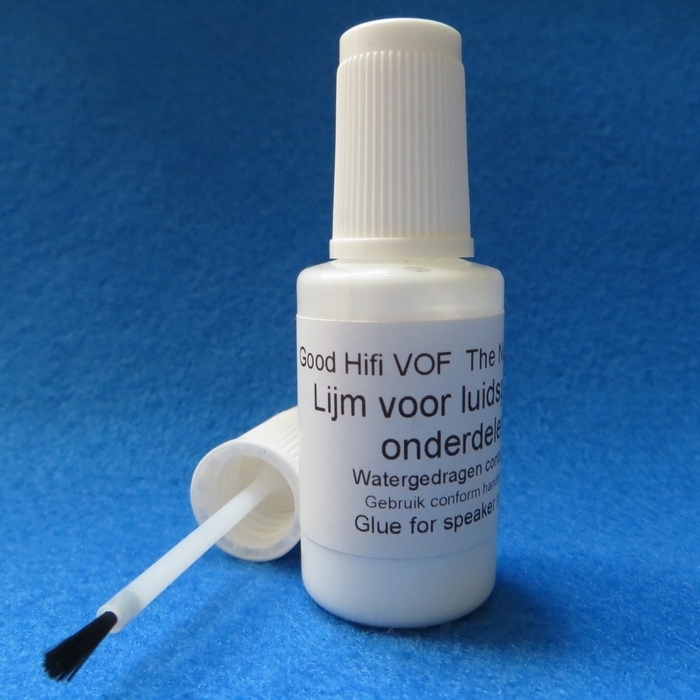 Special water-based, permanent-flexible adhesive for speaker repair. This bottle contains 18 cc glue. This glue is not suitable for gluing spiders and voice coils. This is a water based adhesive. Keep the adhesive in a frost-free room. Surface must be flat, dry, and free dust and grease. Apply the glue with brush or roller. The Elastic adhesive dries relatively quickly. If thicker layers are applied, or the adhesive is used with less porous materials , the drying time will be significantly longer. The glue is dry when the color is transparent and the original white is gone. The adhesive can be applied both single- and double-sided. For a higher final strength and longer drying / processing time we recommend to apply the glue doublesided. Remove wet glue immediately with a wet cloth, dried adhesive residue can be removed mechanically. Clean tools immediately after use with water. Drying time: Depending on the circumstances of 30 minutes to 2 hours. In case of problems the safety sheet is available here (Dutch language). Great praise for your glue, it's the best I've used , among many , because it solidifies slow and elastic.